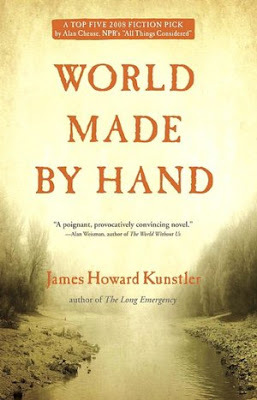 Synopsis [c/o B&N]: "With World Made By Hand Kunstler makes an imaginative leap into the future, a few decades hence, and shows us what life may be like after these coming catastrophes—the end of oil, climate change, global pandemics, and resource wars—converge. For the townspeople of Union Grove, New York, the future is not what they thought it would be. Transportation is slow and dangerous, so food is grown locally at great expense of time and energy. And the outside world is largely unknown. There may be a president and he may be in Minneapolis now, but people aren’t sure. As the heat of summer intensifies, the residents struggle with the new way of life in a world of abandoned highways and empty houses, horses working the fields and rivers replenished with fish. A captivating, utterly realistic novel, World Made by Hand takes speculative fiction beyond the apocalypse and shows what happens when life gets extremely local." Overview: In a small town of New York, the citizens that have survived disease and plague are left to fend for themselves. No widely known recognized government exists, no transportation, no outside food supply; they are forced to band together and do the best they can to keep living. As with all disasters, the bandits are out in full force to take advantage of the weaker members of the scattered society, forcing the people of Union Grove to become people they never thought possible in order to overcome the abuse. Um, not my favorite novel. Very well written, but the story line just didn't appeal to me, even as much as I love apocalyptic stories. The main characters are a diverse bunch, and very easy to relate to, but the eventual elected 'leader' just seems a little too human for my taste. We are generally attracted to strong and decisive people to lead us during crises, but this man seems to kind of fumble along despite the masses that need him to stand up and fight. Although Kunstler did a fantastic job presenting his tale, and while I'm sure it appealed to a different audience, my recommendation is to not waste your time. There are better books out there. Thanks for the book review! I am always looking for new books to read!